In 2008, 2009, 2011, 2013, 2014–2016, fauna of Ground beetles have been investigated in Saransk (Republic of Mordovia, Russia). According to our data and literature, it is presented by 154 species from ten subfamilies. Of them, two species (Bembidion minimum (Fabricius, 1792) и Acupalpus elegans (Dejean, 1829)) are new for the Republic of Mordovia. Agrotechnogenic zone (68.8% of total species composition in the Saransk) includes highest number of species, residential zone (39.6%) is presented by lowest number of species. Proportion of multizonal beetle species was significant: 24.0%. We conducted comparison of species composition in different zones. As a result, two main clusters were determined. Very high values of Sorensen index was between industrial and residential zones, and between park-recreational and agrotechnogenic zones. According to the natural range type, we determined three groups: European-Siberian (35.9%), Trans-Palearctic (31.4%) and European-Mediterranean (13.7%). According to ecological preferences, we determined 11 groups of Ground beetles. Of them, highest number of species is presented in following groups: forest (28.8%), meadow-field (23.5%), forest-marsh (10.5%) and meadow (10.5%) groups. A Checklist of the Ground-Beetles of Russia and Adjacent Lands (Insecta, Coleoptera, Carabidae) by O.L. Kryzhanovskij, I.A. Belousov, I.I. Kabak, B.M. Kataev, K.V. Makarov, V.G. Shilenkov. (1995). PENSOFT Pub., Sofia – Moscow. Alaruikka, D., Kotze, D.J., Matveinen, K., Niemelä, J. (2002). Carabid beetle and spider assemblages along a forested urban–rural gradient in southern Finland. Journal of Insect Conservation, 6, 195–206. Antipova, L.F. (2008). Entomofauna of central part of Pskov city. Vestnik PskovSU. Series "Natural and physical and mathematical sciences", 4, 3–12. Blake, S., Foster, G.N., Eyre, M.D., Luff, M.L. (1994). Effects of habitat type and grass-land management practices on the body size distribution of carabid beetles, Pedobiologia, 38, 502–512. Cameron, K.H., Leather, S.R. (2012). How good are carabid beetles (Coleoptera, Carabidae) as indicators of invertebrate abundance and order richness? Biodiversity and Conservation, 21(3), 763–779. Kirichenko, M., Babko, R., Łagód, G. (2012). Distribution of сarabid beetles (Coleoptera, Carabidae) in the urban area of Lublin. Proceedings of ECOpole, 6(1), 157–163. Kotze, D.J., Lehvävirta, S., Koivula, M., O’Hara, R.B., Spence, J.R. (2012). Effects of habitat edges and trampling on the distribution of ground beetles (Coleoptera, Carabidae) in urban forests. Journal of Insect Conservation, 16(6), 883–897. Magura, T., Tóthmérész, B., Lövei, G.L. (2006). Body size inequality of carabids along an urbanisation gradient. Basic and Applied Ecology, 7, 472–482. Niemelä, J., Kotze, D.J. (2009). Carabid beetle assemblages along urban to rural gradients: A review Landscape and Urban Planning, 92, 65–71. Su, Zh., Huang, D., Zhang, R. (2011). Diversity of ground beetle (Coleoptera: Carabidae) at Cuihu, a newlybuilt urban wetland park in Beijing. 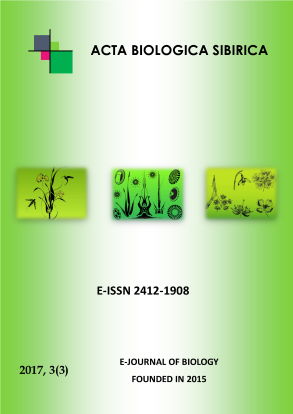 Journal: Biodiversity Science, 19(3), 363–368. Telfer, M.G., Eversham, B.C. (1996). Ecology and conservation of heathland Carabidae in eastern England. Ann. Zool. Fennici, 33, 133–138. Venn, S.J., Kotze, D.J., Niemelä, J. (2003). Urbanization effects on carabid diversity in boreal forests. European Journal of Entomology, 100, 73–80. Weller, B., Ganzhorn, J. (2004). Carabid beetle community composition, body size, and fluctuating asymmetry along an urban–rural gradient. Basic and Applied Ecology, 5, 193–201. Zelazna, E., Blazejewicz-Zawadziñska, M. (2005). Species diversity of Carabids (Coleoptera, Carabidae) in different types of Bydgoszcz urban green belts and suburban environments. Folia biol. (Kraków), 53 (Suppl. ), 179–186.